I had purchased some rye flour for the first time a couple of weeks ago and was anxious to try making some bread with it. Since it was my first time to bake with this type of flour I did a little research. I found that if you don’t use white flour along with the rye the bread will be too dense. After baking the bread I see that statement is so true. I read in one of my cookbooks that the best flavored rye breads use sourdough starters. 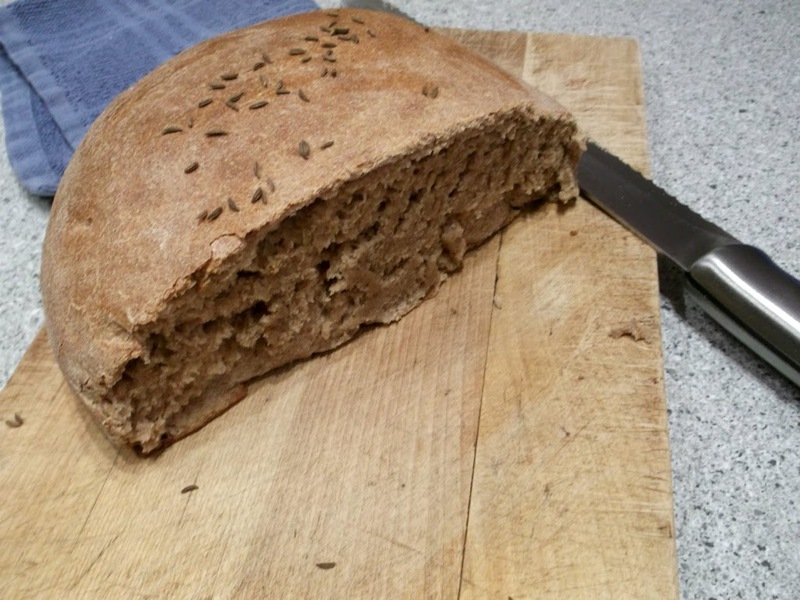 I really liked the idea of sourdough rye bread, but I had a problem with that. You see the starter had to be started a few days before the bread was made so that it can ripen. I didn’t have a few days for this to happen. So I was a little disappointed until I found a recipe that offered an alternative to the starter. The recipe that I found said that buttermilk could be substituted for the starter. I was all for that, so that is what I decided to do. The recipes directions said to mix all the flour in at one time, that made me a little nervous, so I held two cups of flour back and thought that I would work it in gradually. It was a good thing that I did because I ended up not using the two cups of flour. Over all the bread had a great flavor and a nice smooth dense texture to it. 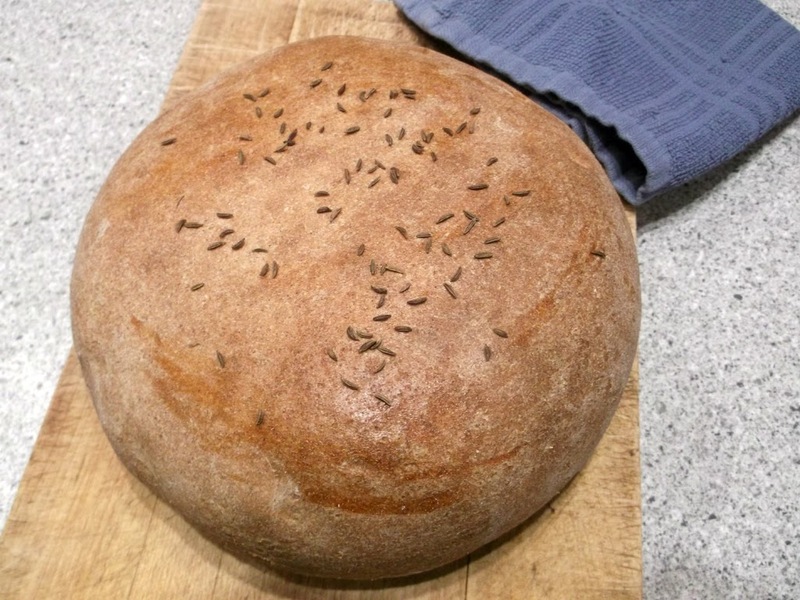 I have to say that we enjoyed it, but I wouldn’t mind making a sourdough starter to see if it would make a difference in the bread. In a large bowl, coming the rye and white flours, salt, yeast, butter, buttermilk, and water. Knead 10 minutes by hand. Grease bowl and turn bread to coat both sides. Cover dough and let rise in a warm place until doubled, about 1 hour. Punch down dough, knead 1 minute and divide in half. Shape each half into a round and place on lightly greased baking sheet. Cover and let rise 30 minutes or until almost doubled. Heat oven to 400 degrees F.
Brush risen rounds with egg white and sprinkle with caraway seeds. Bake 35 to 40 minutes, the bread should sound hollow when tapped. Cool on wire rack. (Note the original recipe called for 4 cups of each flour, if your bread is too stick feel free to use a little more than what I used). Rye bread is so good! Although a lot of flavor comes from caraway seeds. I don’t think I’ve ever had a rye made from a sour dough starter before, and I like the idea. Thanks for the idea! 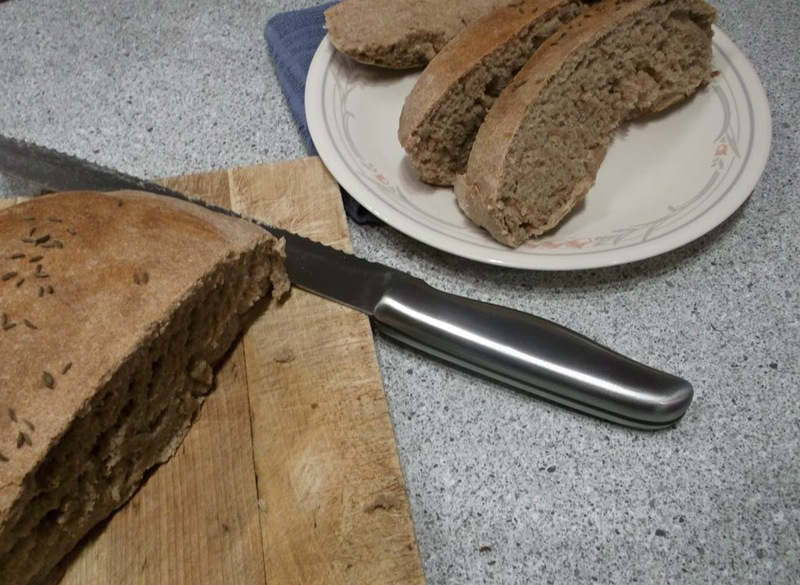 I love rye bread… it looks perfectly baked. I love rye bread! It has the best flavor! Your bread looks delicious! Your bread looks and sounds great. Swiss Cheese grilled on sour dough rye is my idea of sandwich heaven. I am a very novice bread baker but this recipe looks like even I could do it. Thanks!